Kudos to these double duty games. These are the board games that get played with my kids at the dining room table, and that we still play once the girls are in bed. 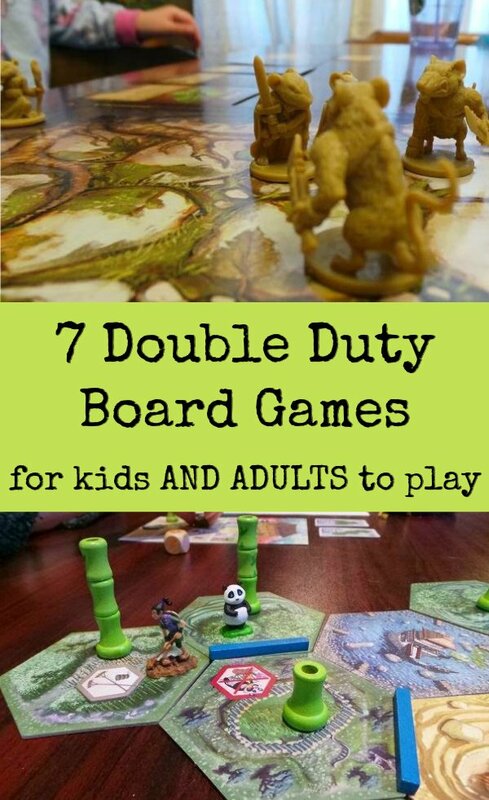 I like to think of it as a two for one deal; you put out money and shelf space for one board game and end up with both a game you can play with your children and a game you can play with other adults. Some of these are games which aren’t necessarily meant for kids which you can play with younger children (my youngest started playing these when she was four). While the rest are games which are marketed as “for kids” which are still fun for adults to play, even when the kids aren’t around. Disclosure: Some of the links in this post are affiliate links. If you click through and make a purchase I will receive a small commission at no cost to you. The box for this super cute Panda themed game says ages 13+. Ignore that. My four year old can play this one. 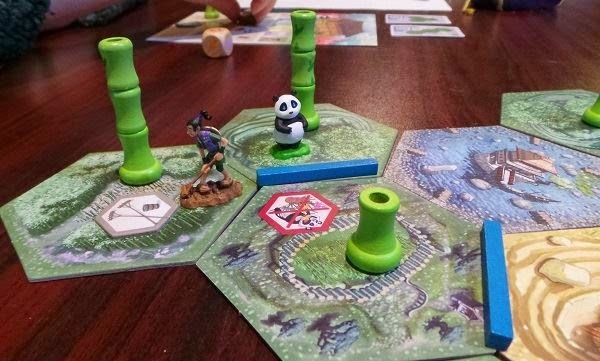 The colourful bamboo pieces and the 3D panda and gardener figurine give this a high cuteness factor. No reading required, the cards which give you the goals are all icon based. Overall the game is strategic yet easy to explain. (But why does that box say 13+? If you want an interesting read, check out this post on BoardGameGeek which explains why many game publishers put 13+ on the box of games being marketed in the US to get around pricey toy testing regulations). Grab a copy here on Amazon.com | Amazon.ca. Take the old playground game King of the Hill, add a dash of Yahtzee and a pinch of the old monster matinees and you’ve got King of Tokyo. Take colourful Tetris-like pieces, now place them flat on a board and take turns putting down pieces, trying to get all of your bits to fit on the board — bingo you’ve got Blokus. This game is extremely simple to explain, yet can be challenging to play versus a clever opponent. My kids picked this up ridiculously quickly, as in the four-year-old had figured it out before I was done reading the rules. Yet I’ve witnessed adults who have gotten flustered by this game, while engaging in some seriously intense gameplay. This is one of my personal favourites. No reading required and the basic principle is very simple: match colour and shapes to lay down your tiles. Scorekeeping math required means younger kids can’t play this solo. This is a kids’ game. A silly dexterity based kids’ game in which you flipper mash (ala Hungry Hungry Hippos) and try and keep Looping Louie from knocking down your chickens. My kids love it and play it frequently on their own. This game is simply not my cup of tea, but people, grown adult people, do play this at our local board game events, frequently and with much laughter. It’s an often requested favourite, so I thought I should include it on this list. This is another kids game which makes the Fun For Adult Play list. Rhino Hero is basically a “build a card house” dexterity game in which you build a skyscraper out of playing cards. You can end up with a three or four foot tall skyscraper, which means you need to play on the floor if you’re playing with shorter children. 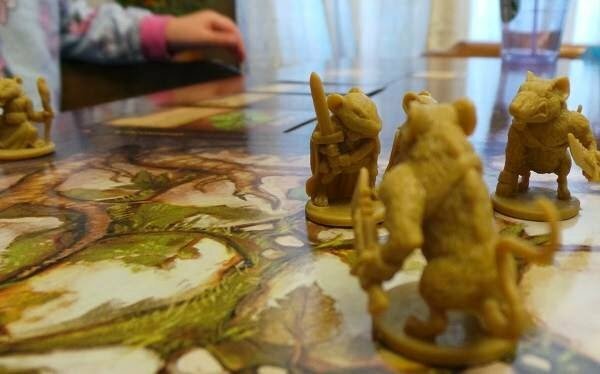 This one is a bit like Mouse Guard meets Hero Quest. It’s a story-driven dungeon crawl where the player character heroes are mice. The miniatures are gorgeous. The anthropomorphic mice can’t help but bring to mind the Mouse Guard comic books, or the Redwall series by Brian Jaques. There is a strong story element to the game, and as you play the story progresses through chapters. The game is meant for ages 7 and up and has heavy text elements. 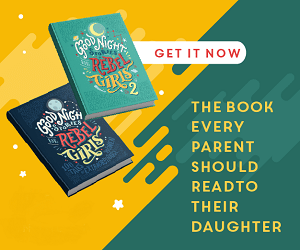 We were able to play it with our pre-literate girls and the game went over well, but despite initial enthusiasm, the 4-year-old wandered off halfway through the game (and not just once, every time we’ve played). The 7-year-old, on the other hand, LOVED every minute of it. We’ve yet to play this one without the kids, mainly because of the progressive story elements, but I know many who play this as an adults only game and I could totally see playing and enjoying this kid free. 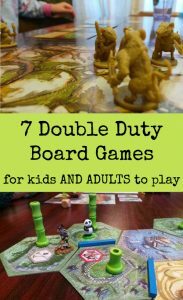 What double duty games would you recommend? We are a big gaming family, we play with the kids and host adult-only game nights. Some of our faves include Ticket to Ride, Codenames and Above and Below. FYI – The name is King of Tokyo, not Kings as written in your post. You are, of course, totally right, King, not KINGS. I love Above and Below, but haven’t played it with the kids yet. Good call, we should try that one on our next family games night. I would try the Blokus game, it sounds like fun for our family. We love board games, these would be so much fun to play. I’ve never heard of these games but they sound like so much fun. I definitely need to branch out when it comes to our family’s board games! These all sound like interesting and fun games! I love that your 4-year-old is able to play a game designated 13+! Game makers need to give kids more credit! We love to play games as a family and in groups of adults some games are great for both you are totally right! We love Takenoko, Trains (this is great if you like Ticket to Ride, it is like that with just a little more going on) Cover your Assets is a big one at our house. We just got Tiki Topple and that is fun so easy yet fun for adults! Castle Panic is a great group game with everyone working together so it works well when you have kids or new to gaming people..
My grandchildren love playing various games with us adults, they’re pretty good at them too. I found your comment “many game publishers put 13+ on the box of games being marketed in the US to get around pricey toy testing regulations” very interesting I didn’t know that.